Fireplace hearths are often referred to as mantels and are a way to draw focus to the fireplace. Hearths may often be seen as the heart of the home, as couples and families are drawn to the warmth and aura of the fireplace, especially during colder winter months. SoCal Fireplace Mantels offers a large selection of fireplace hearths in Los Angeles. Los Angeles fireplace hearths provider, SoCal Fireplace Mantels, has designed fireplace hearths that may be seen in many public facilities that include hotels and casinos. However, 30 years of quality experience includes many residential customers as well. There are a variety of style options that range from more modern and minimalistic in style to those that are more intricate and ornate. Visit SoCal Fireplace Mantels’ showroom of fireplace hearths in Los Angeles to see different fireplace hearths and find the one that meets your needs. Mantels can be made from a variety of materials to suit individual tastes and the desired look to be achieved. 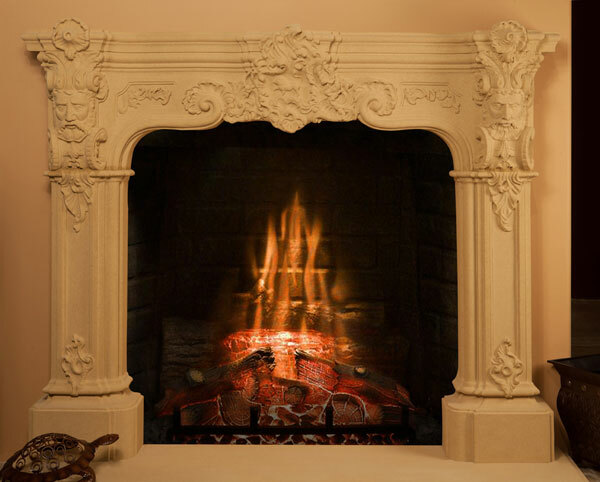 Cast stone fireplaces are created using special glass fiber reinforced gypsum. Other natural materials available include natural travertine, limestone, and marble. Various color and design options are also available to meet various looks and design styles to enhance the living space. While mantels of all types of styles and designs are available, SoCal offers other items for design and purchase, as well. An overmantel is displayed over the top of a mantel and extends to the ceiling for a more extravagant look and feel to any fireplace. Typically made of the same material as the hearth, the overmantel adds a more elegant look to more intricate fireplace mantel designs. SoCal Fireplace Mantels also offers other items made from natural stone materials. These include statues, gazebos, benches, pedestals, tables, planters, and even a large variety of fountains to beautify your yard, as well as your home. You can find a quality selection of fireplace accessories as well. Stop in to the showroom of SoCal Fireplace Mantels, Los Angeles fireplace hearths designer, to check out the selection of available styles, or to speak with a design expert who can help you with a custom fireplace hearth option.